Although this is a written guide it’s meant to be used in conjunction with the video I made. So make sure to watch that too, in that video I will refer to text blocks which can be found here in this article. As mentioned above, the following text blocks are for if you want to follow along with the video! Make sure to fill in your own WiFi SSID, password and passwords for API and OTA! We are going to need these later on! Now that we have all the software we need, we need to find the names the operation system has given our network cards. This differs per Linux version, in my case I’m using Ubuntu 18.10 which renames adapters. Pay attention! In my case the adapters where renamed to different names so I had to change them in the config.txt file. If your adapters are called “wlan0” and “eth0” you don’t need to change the config.txt file since the default values are correct. If your file is not on the machine you are running the flash software on (for instance you are using a Raspberry Pi with a clean raspbian install) you need to transfer it over. The easiest way to do this is by downloading the file on your desktop as instructed in the video and then running a program called “WinSCP” or “FileZilla Client”. With it you can transfer files over an SSH connection and transfer the file over the Linux PC. Once you have the file in place in the “files” directory we we can start the flash script. Once that is running and you’ve entered “yes”, open a second terminal window or SSH session and run the following to see the “wifi” log file. After this startup the software again and follow the instructions. If more things go wrong or nothing seems to happen make sure to take a close look at the other log files also located in the “scripts” directory, they can give you valuable information what might be wrong. 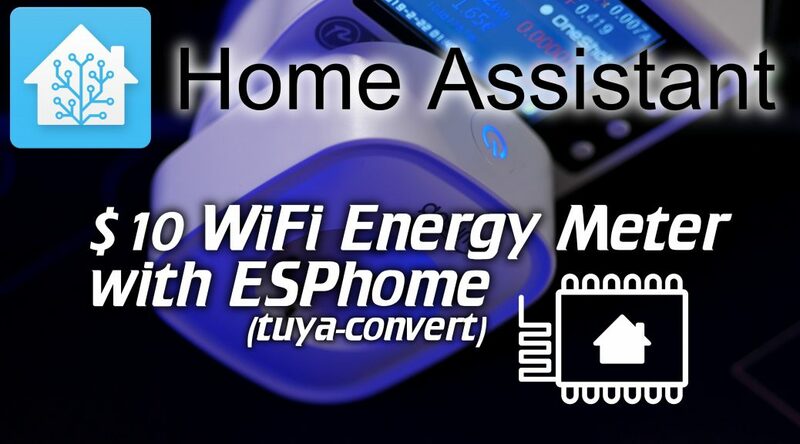 This will be part of the second video where we will flash the full config on the now ESPhome running smart-plug and link it to Home Assistant. Use CTRL-F to find and replace “energy_temp” with unique values for this specific meter. !There is updated code lower on this page, go and copy that instead of what is above this text! Once that is uploaded and active I advise you to do some calibration with an external meter. I recommend using the following meters for that, these are quite a bit more expensive but come with an easy to read and responsive screen and it has a factory good factory installed auto-adjusting calibration! The calibration can be changed in the ESPhome code by varying the “current_resistor” and “voltage_divider” values. To get a higher wattage use a lower number for the “current_resistor”. Voltage works in reverse, to get a higher voltage, use a higher number in “voltage_divider”! Changes should be made with small numbers, so try raising or lowering the numbers by 5 to start with. The Home Assistant lovelace card used is called “mini-graph-card” and can be found by clicking on the name! This makes replacing the number in all the separate metering plugs a lot easier since you can now just change the one substitution and it will change all the parts of the code for you! I’ve also done the same for the “current_resistor” and “voltage_divider” values so you can always edit them at the top! The third video is about using Grafana to make some nice graphs about all the data we are now collecting in Home-Assistant. This isn’t a full tutorial on how to setup Home-Assistant and have it send its data to InfluxDB and then then let Grafana use that data. Lots of how-to’s have been written for that, so check one of those if you don’t have this setup yet. Or watch the video below and then decide if you want to set this up. The fourth and last video in this series (for now) is going to be how we were able to lower our power usage because of the insight these plugs provided and some automations using Node-Red that can be configured to again, use less power and hopefully, in the end, make these plugs pay for themselves! However, the energy_XX_Total Daily Energy in the plug web interface seems to be different from the total usage in Grafana, using the integral and cumulative_sum, like you explained in your video. I can’t figure out why this is. Any thoughts? Do you perhaps have periods where your device uses 0 Watt? There seems to be an issue with calculating the integral on those periods, as InfluxDB has no data at those moments. Currently trying to figure out why that is. If it is ESPHome not sending data to HA when it is 0, or if HA does not transfer it to InfluxDB. Well, to answer my own question, here’s what I’ve done so far. Evereything works (including the button press) except for the red LED, maybe someone could figure that out? Can you explain if the complete git clone needs to be transferred to the root map of the raspberry pi? the map tuya-convert is now on the raspberry only the command ”/install_prereq.sh” can’t exclude. there is something that i do wrong on that part. Awesome vid! I immediately bought several Blitzwolf BW-SHP2 via the AliExpress the affiliate link as a token of appriciation and for adding them to my home automation setup of course. However, these now seem to be shipped with updated firmware that is not yet supported by tuya-convert. Installation on a RPI3 B. Logs show no errors, but the communication is never started. I noticed an issue was already opened on the Tuya-Convert project page. New buyers might want to back off until a fix is found and released. I find it hard pressed that you got one with updated firmware, it’s going to take weeks if not months before those are out of the factory. Did you by chance try the plug in the Tuya App? Because then yes, they try and prevent this method!